The Ambassador Group has recently upgraded its membership (Ambassador Plus Card) to a new worldwide Accor membership (Advantage Plus Card). The two parties held an MOU signing ceremony on March 30, 2006 to publicly announce the integration of the membership. At the signing ceremony, the two representatives from each group, Mr. Joo, Myung-gun from Ambassador Group and Mr. Ray Stone, Senior Vice President of Accor Asia Pacific, from Accor signed on the MOU for the new membership card, Ambassador Advantage Plus Card. 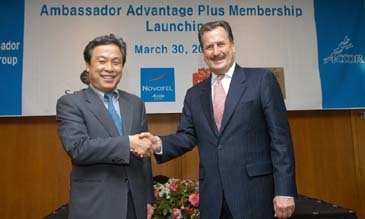 The newly upgraded membership, effective as of April 1, 2006, adds various benefits when members travel around Asia Pacific region, which weren't offered with the old membership. New members of Ambassador Advantage Plus Card can have all the benefits of all Accor hotels in Seoul (Sofitel Ambassador Seoul, Novotel Ambassador Gangnam, Novotel Ambassador Doksan, Ibis Seoul and Ibis Myeong-dong) on guestroom and F/B outlets. Also, the new membership card offers 50 percent off on guestroom and discounts on restaurant meals at all Accor hotels throughout the Asia Pacific region. Five Accor-Ambassador hotels in Seoul will celebrate the launching of new membership and are offering a special promotion sponsored by Jaguar Cars Korea from April 1 through June 30, 2006 for three months. 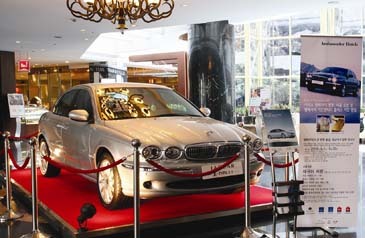 New members and upgraded members will have a chance to win a 'Jaguar x-type 2.1' by lucky draw. Guests with a minimum 100,000 won receipt are also eligible for the lucky draw promotion. - Asia Pacific: 25% off on dining (1 person), 50% off for 2 people and, 33% off for 3 people and 25% off for 4 people.